Sister Susie preferred to go out on Thursday night, the night before her actual birthday for a celebration dinner. Zorba and I had tried to book into L’Arco Del Cappuccini – allegedly one of the best restaurants in Taormina – without success. So we booked into the restaurant next door, Tiramisui, where we had enjoyed a beautiful meal a couple of days before. The whole family came out to dinner – Master Sam 3, Miss Indi 5, Susie, my bro in law Ben, Mum Gina, Dad Walter, and husband Zorba. We did what we always do when having dinner with the kids in Italy, order for them first. Sam wanted pizza and Indi wanted her standard, pasta with tomato sauce. Both kids did well and had very simply yet tasty dinners. To be fair, the kids were really good going out to dinner most of the time and they were good this night for the first 90 minutes. Then they got bored and fidgety. That’s when the kid-rescuer gets fired up, the portable DVD player featuring this week’s favourite animated feature, Robin Hood. Man, those kids must have watched Robin Hood 17 times in two weeks! Zorba and I had talked up our lovely dinner at Tiramisu somewhat, so everyone’s expectations were high. Nonetheless, we all had lovely antipasti and mains. I opted for marinated scampi followed by fresh pasta with porcini mushrooms. 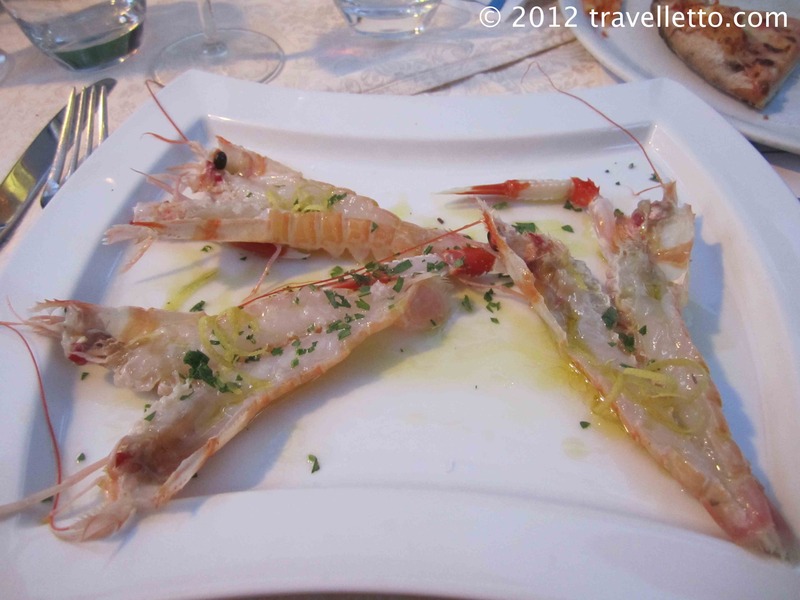 Both were beautiful, but the scampi was particularly light, fresh and delicate. I didn’t want to share it because it was so good…but I did! Zorba loved his starter of octopus cooked in balsamic. His main of linguine with sea urchin was not to my liking – sea urchin has a very fishy seaweedy almost flavour to me, but Zorba loved it. Ben opted for the traditional Sicilian pasta dish of tagliatelle norma – with eggplant and breadcrumbs, followed by a mixed seafood grill. 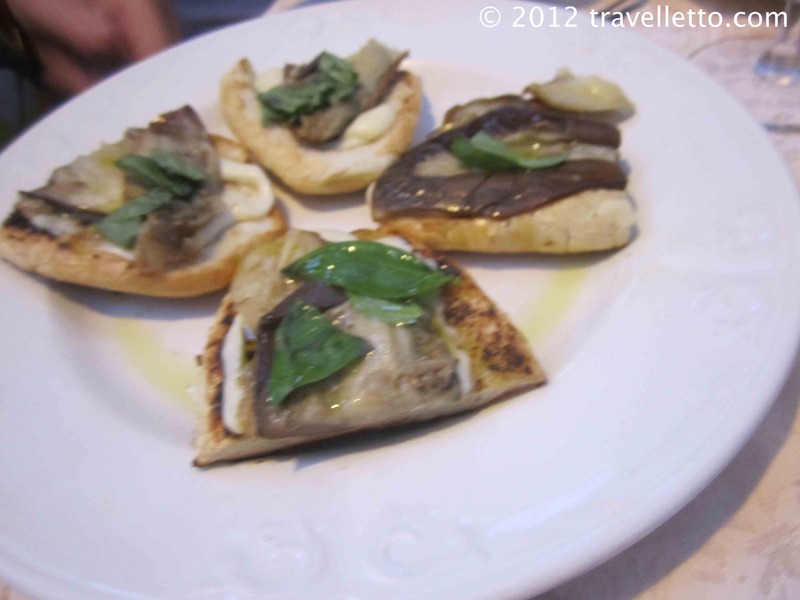 Mum’s bruschetta with eggplant was really delicious. For mains, she just had a plate of grilled vegetables and shared Dad’s pizza of grilled vegetables and balsamic (no cheese!). 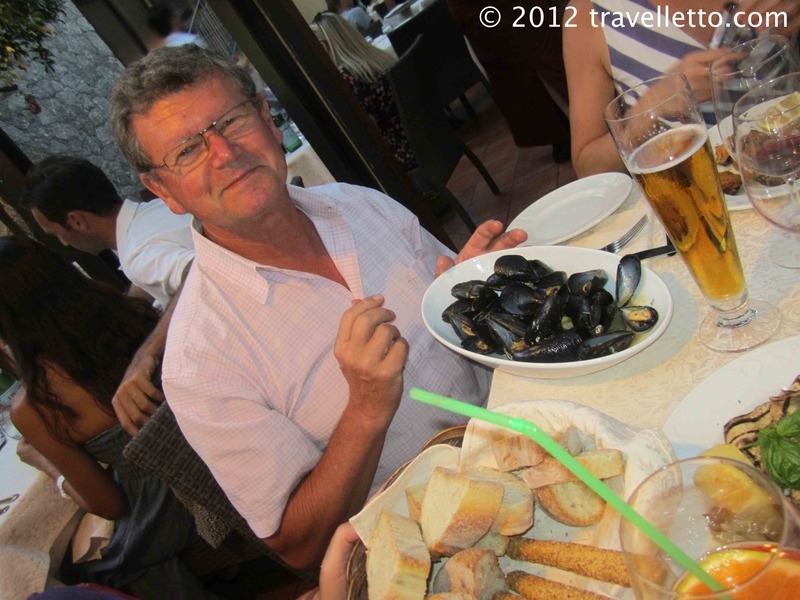 Dad has hot mussels to start and he loved those! We were all feeling pretty full, however, it was Susie’s birthday dinner so when she slipped away to the ladies room, I asked the waiter if he had a piece of cake that he could bring out for her and passed him a packed of birthday candles. The waiter recommended some tiramisu – I concurred. That sounded good! When Susie returned to the table and started talking about finding a gelato for dessert, along came her birthday cake tiramisu – and wow – it was HUGE! It fed all eight of us! The tiramisu was so gorgeously light and unbelievably tasty. The tiramisu I make is also delicious, but it is a lot heavier than this one. I could have kept eating that until I burst. It was gorgeous! Nephew Sam even liked it! I spoon fed it to him while he was on automatic pilot watching Robin Hood on the portable DVD player. Watching Sam go through a caffeine high on the way home from the restaurant was something else. It was the kid was charged with super duper everready batteries. He kept running and jumping and running and jumping. This did not calm down when we got home either. Running in the villa, jumping on couches, up and down stairs! Not surprising really. It took him about an hour to wind down and get to sleep. It was a lovely family dinner out. Happy Birthday Susie!